PRINCETON, N.J. -- U.S. small-business owners have become more optimistic, ending three consecutive quarters of declines in optimism. 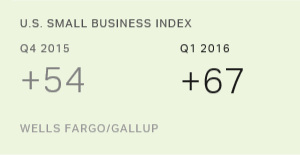 The current Wells Fargo/Gallup Small Business Index score is 67, up from last quarter and almost back to where it was one year ago. 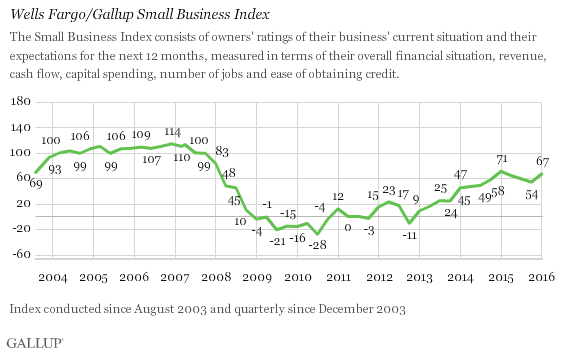 The Small Business Index fell sharply in 2008 and in the years after because of the Great Recession, but rose steadily from early 2013 to the beginning of last year. By the second quarter of 2015, however, small-business owners' optimism began to edge down, before rising again this quarter. More specifically, the current index score of 67 is up from 54 in November 2015, 59 in July 2015 and 64 in April 2015. The current score is within four points of the seven-year high reached a year ago, 71. This quarter's increase is linked to an uptick in small-business owners' perceptions of their cash flow, and the current 60% of owners who report a "very good" or "somewhat good" cash flow is the highest recorded since Quarter 4, 2007. Future expectations of cash flow have also been trending up -- and are as high today as in Quarter 1, 2008. The increase in this quarter's overall index score is also related to a combination of incremental improvements in business owners' perceptions of their current financial situation, future revenues and access to credit. 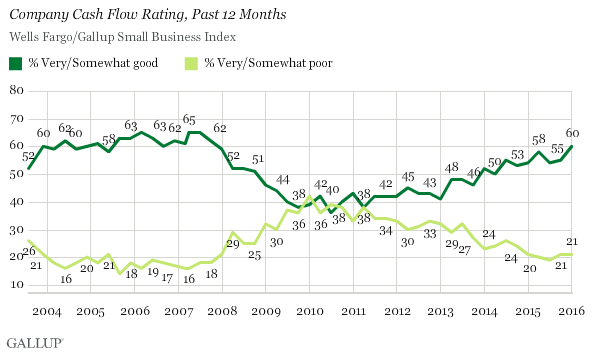 On the other hand, the percentage of small-business owners responding that it has been difficult to obtain credit in the past 12 months, while not significantly changed from one year ago, is technically at its lowest point since 2008. Currently, 19% of owners say it was "very" or "somewhat" difficult to obtain needed credit in the past 12 months, and 20% expect it to be difficult in the next year. Other components of the index show small increases or are unchanged. 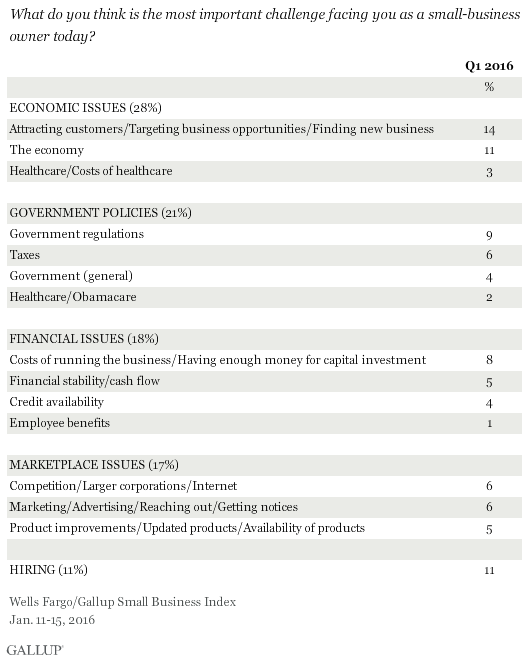 Small-business owners' reports of the most important business challenges they face cover a wide variety of concerns, including attracting customers (14% mention), hiring challenges (11%), the economy (11%), government regulations (9%), the costs of running a business (8%) and taxes (6%). These concerns are typically the ones that owners mention as their biggest challenges, although the order of concerns shifts somewhat from quarter to quarter. When combining challenges into broader groupings, economic issues and the impact of government policies tend to top the list. Small-business owners' optimism about business and financial conditions has risen in the first quarter of 2016, returning to approximately where it was a year ago after three quarters of declines in the spring, summer and fall of 2015. However, this level of optimism is still well below prerecession numbers. 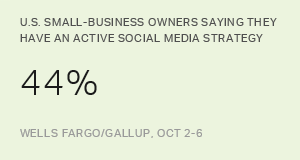 Owners interviewed as part of the Wells Fargo/Gallup Small Business Index are particularly positive about their business' cash flow. Owners report their single biggest challenge is finding new customers and business opportunities, followed by the challenge of hiring good people and dealing with the impact of the general economy and government regulations. Results are based on telephone interviews with 600 U.S. small-business owners in all 50 states, conducted Jan. 11-15, 2016. The margin of sampling error is ±4 percentage points at the 95% confidence level.